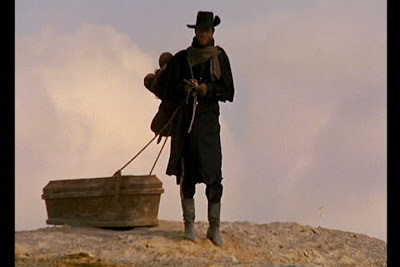 One of the few spaghetti westerns to earn popularity in the west outside of the Sergio Leone’s films was the hyper-violent “Django” (1966), about a man who drags a coffin behind him everywhere he goes. Director Sergio Corbucci vaulted out of B-movie obscurity in the wake of “Fist Full of Dollars” (1965) and took with him lead actor Franco Nero, assuring both a place in cult history. 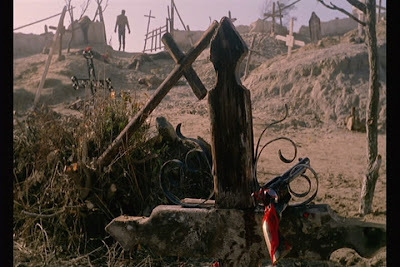 During the opening credits Django is seen dragging his heavy wooden coffin through a virtual sea of mud. Eschewing traditional back-story, an operatic ode by Luis Enriquez Bacalov blasts out of the soundtrack, informing us that Django’s love is dead and that he will never love again. 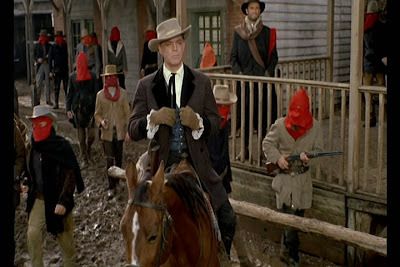 Clearly, we have entered the story at a point where Django is already pissed. Soon the wandering killer comes upon a woman being beaten by Mexicans. These Mexicans are slaughtered not by Django, but by a nearby band of Confederate soldiers who have equally despicable intentions for the weeping damsel. After spouting some suitably existential one-liners, Django dispatches the fools with a round of lead. He takes the woman and moves on to the nearest town, a mud-soaked hellhole caught between Major Jackson’s sadistic racist army (who look like crimson KKK members) and a band of Mexican rebels. Django is well on his way to fulfilling his cryptic quest, dragging his coffin along the way. For those who don’t yet know, I won’t spoil exactly what is in the coffin or what it means, but I can mention that it doubles as a bridge during stealth missions. 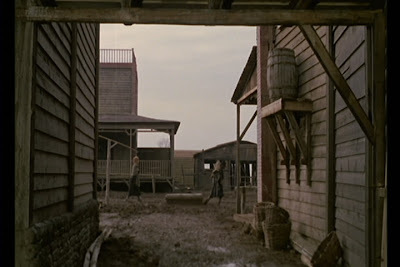 Sergio Corbucci doesn’t quite have the talent of Leone, but he does put the cinemascope dimensions to good use with plenty of gorgeous images of the bleak settings. He also knows how to rocket the violence to outrageous heights (enough to get the filmed banned for 25 years in the UK). In one of the film’s most gruesome scenes, a man's ear is hacked off and fed to him (Quentin Tarantino admits to stealing the shot for “Reservoir Dogs” (1992)). 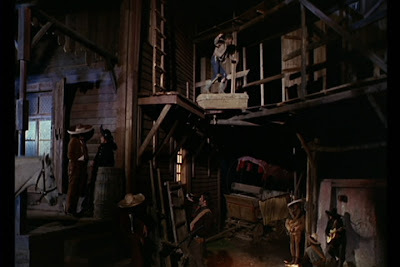 More often, batches of six men at a time (convenient since Django wields a six-shooter) approach Django while cackling and then get mowed down by the gunslinger’s lightning reflexes. Django was such a hit upon its release that it inspired more than 50 unofficial sequels. None could quite live up to the original. While often very derivative and not really as stylish as it could be, “Django” is still recommended for its cold-blooded existential hero and a handful of brilliant scenes, including a blazing final showdown that would influence the kung fu classic “Five Fingers of Death” (1972). According to Hollywood heresy, this is also where Bobba Fett's father, "Jango" Fett, (from the Star Wars franchise) gets his name.